Spinning Yogis + Quinoa Bar Vegetaria -double shot. ONE OF THE MOST CONVENIENT DOUBLE-SHOTS YOU’LL EVER GO ON SINCE YOU’VE GOT A ONE MINUTE WALK. FIT IT INTO YOUR SPANISH LUNCH HOUR (SO REALLY YOU’VE GOT TIME) FOR A vinyasa FLOW AND FAST VEGAN FOOD. ALTERNATIVELY YOU CAN GET YOUR HIT OF YOGA AND SPIN ALL IN ONE WEEKEND CLASS. START: Travessera de Gràcia, 209, 08012 Barcelona. FINISH: Travessera de Gràcia, 203, 08012 Barcelona. THE WORKOUT: Julia’s Thursday 12.30 - 13.30pm “Flow and glow” vinyasa class. 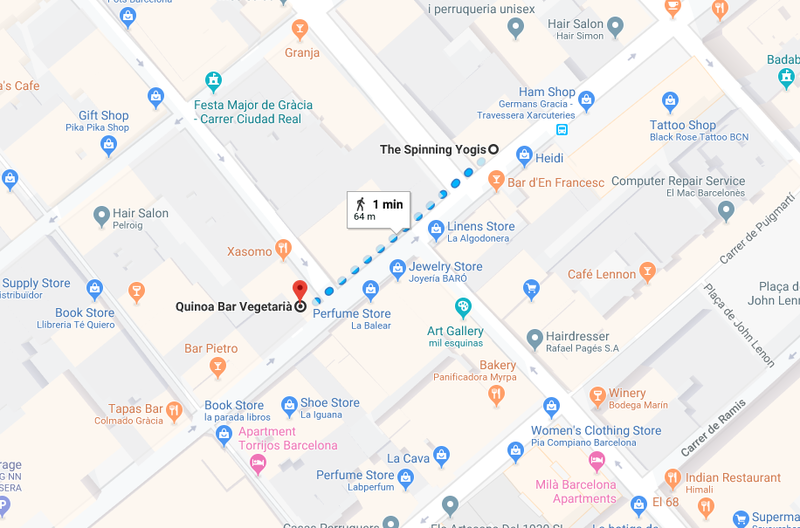 Spinning Yogis is little haven off a busy street in Gracia, with a quiet, cosy room for yoga and the other for spinning. If you enjoy practising arm balances, trying new postures and being a bit free and silly then this is the class for you. Julia has an amazing energy and sets pretty challenging sequences. But this also means you’ll laugh, explore and try new things in your practise. Plus by the time you get to Savasana you can reach your higher place and switch-off in seconds! Mats and props are all available to use so no need to lug your mat around with you before class. If you want to try out the spin and yoga combination then the studio’s weekend class with Adriana at 11:30am-12:30pm mixes 30 minutes spin and 30 minutes Yoga - the perfect compromise. Get clipped in to your bike and then watch the big screen for your heart-rate, distance and power as the class puts you through your paces. When 30 minutes are up, move to the yoga room for a complementary flow and stretch. FOOD: A tiny hole-in-the-wall place that serves up home-made vegan friendly food - made with love and care by super friendly staff. It’s the perfect lunchtime spot for a fresh juice and tasty vegan / veggie wrap or salad to tide you over for the afternoon. Plus a place that has vegan chocolate-filled croissants, lunch and a good wine menu is a winner in our eyes. Perch up on a stool at the bar or on one of the tiny tables to eat your quinoa wrap. This is the house special - with red beans, tomatoes, spinach, quinoa, jalapenos and vegan mayo. The Italian salad is mix of courgetti and sundried tomatoes with a vegan pesto and nuts is also a Mediterranean dream. If you want something more substantial there’s a daily fresh burger flavour that rotates on the menu (think beetroot or quinoa or sweet potato burger) that you can get with a portion of fries or extra cheese. Vegan cakes are also plentiful; carrot and chocolate seemed to be the popular ones to have with a milky coffee mid-afternoon. For those staying on the straight and narrow side of health then ignore this. PRICE: First-timers can sign up to try the studio for a whole week for just €15. A standard drop-in a class is €15. A 6 class pass (with an extra two free) is €60. The monthly spinning yogi package gets you unlimited yoga and spinning for €79 per month. With any package use of the yoga mats and spinning shoes is included. Quinoa’s prices are just as friendly as their staff. All wraps, burgers and sandwiches (“Bocadillos”) are €6, extra cheese is €1.5, Italian salad is €7. Fresh juices are €3.9. BEST FOR: Convenience and a balancing focused yoga practise.